In a previous post, I talked about modeling flowcharts with C# code. The flowcharts are designed, documented, and standardized by a non-profit organization charged with measuring the quality of patient care inside of hospitals. They do so by looking at common cases that every hospital will see, like heart failure and pneumonia patients. The logic inside each flowchart can determine if the hospital followed the “best practices” for treating each type of case. Some of the logic becomes quite elaborate, particularly when evaluating the types of antibiotics a patient received, and the antibiotic timings, relative orderings, and routes of administration. Sitting down with 100 of pages of flowchart logic was intimidating, and realizing that new versions came along every six months was enough to induce fear. I experimented with a few visual tools and rules engines but nothing was making the job easy and producing a maintainable solution. Not great, but it wasn’t too hard to read. It also made me realize that only a few simple abstractions were needed to make an executable flowchart. 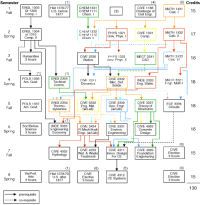 Flowcharts contain shapes, and shapes contain arrows, and each arrow points to another shape and has an associated rule to evaluate and determine if the arrow should be followed. I showed the code to a couple of these classes in a previous post. The only hard part then would be correctly assembling shape, arrow, and rule objects into the proper hierarchy for evaluation. One option was to parse instructions like the text that I had put down on paper, but I wanted to try something simpler first. “Object graph” is a computer scientist’s term for a collection of related objects. I needed to arrange shapes, arrows, and rules into an object graph. We deal with object graphs all the time in software. ASPX files describe an object graph that is assembled at runtime to emit HTML. An even better example is XAML - the XML dialect for WPF, Silverlight, and WF. XAML is the direct representation of a hierarchical graph of CLR objects. I considered what a flowchart might look like in XML. The one stickler was how to represent the rule for an arrow. There are mechanisms available to represent expressions and code in XML (XAML’s x:Code directive element and serialized CodeDom objects ala WF rule sets are two examples), but code in XML is always tedious, cumbersome, and worst of all - impervious to refactoring operations. Not to mention, I think many developers today are feeling “XML fatigue” – me included. Five years of XML hyperbole followed by 5 years of software vendors putting everything and anything between < and > will do that. The other option was to assemble the flowchart using a fluent interface in C# – a.k.a an internal DSL. Chad Myers recently posted some excellent notes on internal DSLs, which he defines as “…bending your primary language of choice to create a special syntax that’s easier for the consumers of your API to use to accomplish some otherwise complicated task”. Chad also has notes on the method chaining pattern, which is the approach I took. …and another extension method to add an Arrow to a Shape. The trick was realizing that the arrow would always apply to the last shape added to the flowchart. Overall I was happy with how quickly we were able to pound out flowcharts using the fluent API. The code is relatively easy to compare to the original flowcharts in the specifications (although with the larger flowcharts, nothing is too easy). It’s also easy to test, diff-able after check-ins, and still works after refactoring the underlying data model. The real measure of success though, will be how well the code stands up to the changes and revisions over time. The verdict is still out. I really like your approach. I'd like to see more posts digging deeper in your solution. Keep them coming! Very interesting! I <3 fluent APIs. With what's been demoed about Oslo and M at PDC, do you think there might be an advantage to doing this kind of thing with those technologies? How much of this functionality would translate? Yes, I've done some reading about MGrammer and I'd be interested in seeing how this would translate. It looks like I might be able to implement something that could parse my orginal "natural language" text. My concern is that MGrammer would turn out to be a lot more work, and I'm not sure there would be much of a benefit. I'm also curious to see how maintainable such a solution - would changes to the models in C# code cause the DSL to break unexpectedly? Will unit testing work? I'm also nervous about the SQL Server repository that Oslo uses and how that works with change control, testing, and CI. From what I've seen, you don't need to involve the repository if you don't want you. You can just parse the DSL scripts directly, treating it kind of like XML without the angle bracket noise. @Kevin: that would be good.